An honour roll commemorates members of the Bealiba Mutual Improvement Society who served in World War One. Mutual Improvement Societies were democratic and usually provided instruction by working men themselves in elementary and sometimes in other subjects. Political discussion was also a major feature and they became an important training ground for social and political reform. At a meeting of the B.M.I.S. last night the new Honor Roll was unveiled. 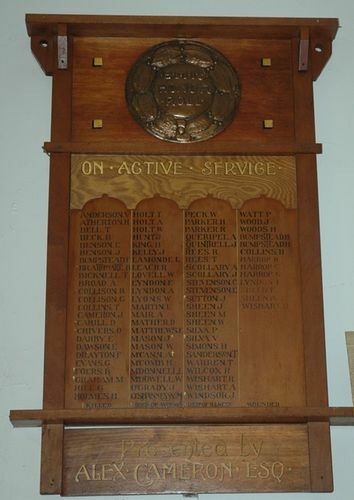 The roll, which contains 81 names, is of very elegant design, and is composed of a frame of Australian blackwood and rosewood, surrounding a panel of Kauri on which the names of our recruits are inscribed in gold lettering, distinctive marks being supplied where sad necessity demands it, to denote ''killed," "died of wounds," " died of illness," and " wounded." The upper portion of the frame bears an embossed copper shield, with the words " B.M.I.S. Honor Roll,'' and beneath on the pannelling is the inscription— " On Active Service." The whole was designed and executed by Mr E. J. Peck, architect, of Maryborough, and that gentleman is to be congratulated, upon the taste and skill which enabled him to produce such an appropriate and beautiful specimen of handiwork. It may not be generally known that the donor of the roll is Mr A. Cameron, president of the society, though we are are sure that no one to whom this is news will be surprised at it. Bealiba Times (Vic), 9 March 1917.